VERY AFFORDABLE : Instead of grabbing a can of soda or Purchasing Water Bottle, SAVE MONEY, use these GE FILTERS which are also KENMORE FILTERS and ASSURE YOUR ENTIRE FAMILY’S HEALTH drinking FILTERED PURIFIED WATER for MUCH LESS MONEY – a cost-effective alternative to OEM filters. Suddenly realize that everyone is enjoying BETTER TASTE, drinking more water, and maintain yours and their health. TWIST AND LOCK EASY DESIGN : Simple design provides easy, tool-free, no-mess filter replacement to change efficiently & have everyone enjoy every single cup of water. The PureGreen MWF Water Filters improves taste-making each glass of water healthy and hydrating. Each and every filter with highest standards bringing you the purest water to the last drop. This generic replacement GE 3 pack filters last, approximately 6 months, as long as the OEM filter by a fraction of the price. SAVE MONEY. You can never be too certain about your refrigerator’s water quality. Especially, if you have been using the same, poor quality water filter for a long time, various contaminants and pollutants can escape and make their way into your drinking water. 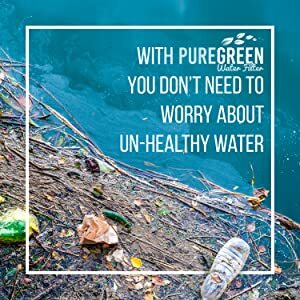 That’s why, here at Pure Green, we have only one mission in mind; to improve the quality of your refrigerator’s drinking water to the last drop and help you become the healthiest version of yourself at the same time! BUT WHY TRUST US WITH YOUR HEALTH & WELL-BEING? The answer to this is simple. We are the only ones that feature Authentic NSF42 and WQA to meet the NSF53 requirements and make sure the water that is provided by our filters is 100% Lead-Free. We are one of the top manufacturing companies for water filtration systems and we can promise you that by installing one of our fridge filters will not only upgrade the quality of your drinking water but it will also remove weird tastes and odors and improve your family’s health and safety in the process. Depending on where you live and the quality of your city’s water, your drinking water might actually be very dangerous to put in your body. Even with today’s purification techniques and treatments, a lot of contaminants can still be present in your drinking water. 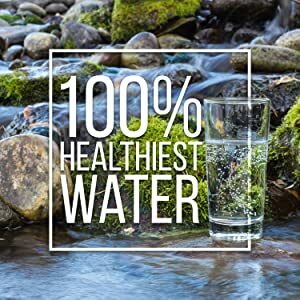 Our fridge filter is designed specifically with an Activated Sourced Coconut Shell that will bind all Pharmaceuticals, Parasites, Benzene, Mercury, Asbestos, Lead, Particulates, Turbidity, Atrazine and Lindane and lead only to SAFE drinking water! Since our filters are upgraded with activated carbon, they will also remove odor, chlorine, weird metallic taste, rust and dangerous heavy metals that can compromise your health. It is an undeniable fact that most water filters nowadays are powerful. In fact, they are so powerful that they remove EVERYTHING, including certain minerals and electrolytes that our body needs to remain healthy. That is why our filter is certified to maintain all these valuable minerals while removing only the harmful pollutants and contaminants. HIGHEST QUALITY, PURIFIED WATER WITHOUT ANY HASSLE! Now you can have 100% purified water without any convoluted installation instructions, complicated tools or any sweat! Just spend a few minutes to install this purification filter and you’ll have crystal-clear, delicious-tasting water for the next 6 months! Make The Pure Green Filters Yours Today & Improve Your Health By Drinking Clean & Fresh Water Every Single Day!